How the REAL-ID Act is creating a national ID database | Papers, Please! How the REAL-ID Act is creating a national ID database – Papers, Please! Q: Is DHS trying to build a national database with all of our information? No. … REAL ID does not create a federal database of driver license information. In fact, as we’ve been pointing out and as others have noted, the REAL-ID Act is both building a national database and requiring any state that wants to issue drivers’ licenses or state ID cards that are “compliant” with the REAL-ID Act to grant all other states access to their state’s drivers’ license and ID card data. Many state legislators and residents of states that are considering whether to start issuing “compliant” driver’s licenses are concerned about (a) whether this would affect residents of those states who “opt out” or choose not to have a gold-starred compliant license (it would, as we’ve discussed previously), (b) whether there would be a central database or list of all drivers or ID cardholders (there would be, as discussed below), and (c) what we mean when we say that the goal of the REAL-ID Act is the creation of a “distributed” national ID database in which a single query routed through the central “hub” can retrieve data from every state ID database. Both the Federal law and the regulations issued by the DHS to implement the law are silent on how this access is to be provided. In theory, a state could comply with the REAL-ID Act by setting up its own ad hoc database access arrangements with each of the 55 other states and US territories. In practice, that would be prohibitively expensive for any state, especially a small state, as state authorities who have looked into this possibility have concluded. The only realistic choice for any state that wants to issue licenses or IDs compliant with the REAL-ID Act is to plug its state database into the national data “hub” which has been developed, with Federal funding and in consultation with the DHS and other Federal agencies, to serve this (and possibly other) purposes. 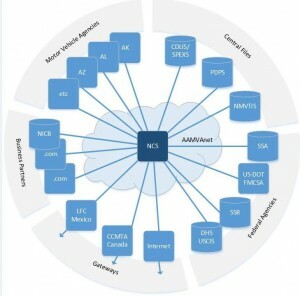 As we’ve reported previously, the national REAL-ID Act “hub” software and central database has been developed by the American Association of Motor Vehicle Administrators (AAMVA) and AAMVA contractors, primarily Clerus Solutions. Multiple layers of outsourcing and subcontracting serve to evade accountability to government agencies and the public, to evade transparency under the Federal Freedom of Information Act (FOIA) and state public records laws, and to give a thin veneer of plausible deniability about the central role of the Federal government in planning and developing the system. AAMVA is a “trade association” whose members are officials of state agencies, but which is incorporated as a “private” nonprofit organization not subject to public records laws. Federal funding for system development was laundered through state agencies and then through AAMVA. According to AAMVA, “In October 2012, AAMVA was awarded a contract from the Mississippi Department of Public Safety under a grant from the US Department of Homeland Security to develop the State to State Verification Service leveraging the modernized CDLIS system architecture.” CDLIS is a centralized database and system for the exchange of information about holders of commercial driver’s license, who are already subject to Federal DOT regulations related to interstate transportation. S2S, as discussed below, extends the CDLIS architecture and protocols from commercial licenses to all driver’s licenses and state-issued ID cards. Mississippi subcontracted portions of the project to DL/ID Verification Systems, Inc. (DIVS), “a not-for-profit corporation formed by the State of Mississippi to organize, implement, and coordinate the electronic systems states need to verify identification information provided by driver license and identification card applicants.” AAMVA and DIVS then subcontracted with Clerus Solutions (a private for-profit corporation full of former AAMVA and government personnel, like many companies in the revolving-door homeland security industrial complex) to manage and carry out portions of the actual work, using primarily commercially available off-the-shelf software, which potentially involves additional layers of outsourcing. It remains unclear who actually hosts or operates the central data stores or host site applications, or where they are located. To obscure the total cost and true source of funds for the project, and the leading role of the DHS, additional money for the REAL-ID Act hub was buried in block grants to states for “highway safety data” and “traffic records” systems from the National Highway Transportation Safety Administration (NHTSA) of the Department of Transportation (DOT). According to AAMVA, “NHTSA has acknowledged that … grant monies can be used to fund a state’s implementation activities and operational costs for the State-to-State Verification Service (S2S).” Money is trickled down from DOT, divided among states and commingled in block grants categorized as highway safety funding, passed on to AAMVA and DIVS, and then reassembled to pay the contractors doing the work. There’s no single line item in the Federal budget or contract with a Federal agency disclosable through FOIA that reveals the total price and scope of the work. The REAL-ID Act hub system is described as consisting of “State to State (S2S) Verification Services” and “State Pointer Exchange Services (SPEXS)“. The terminology of “state to state” and “exchange” is used to mislead those who don’t read the 2000+ pages of SPEXS specifications into thinking that the “hub” is merely a “switch” that connects states to each other, and doesn’t itself hold or process state data. 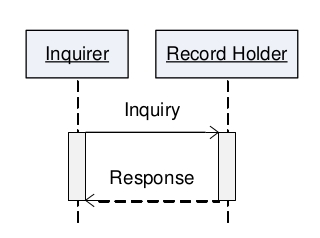 But if the requester doesn’t know which state(s) has/have records — for example, if they want to know if the person with a particular name and date of birth, or Social Security number, has or has ever had a driver’s license in any state(s), and if so which one(s) — this system would necessitate sending the inquiry to each of the 56 states, the District of Columbia, and US territories. Each state would need to search its database for responsive records. The consequence would be a large and potentially burdensome (especially for small states) volume of queries and searches for each state to have to process. The “pointer file” at the “SPEXS Central Site” is the national ID database created by the REAL-ID Act: a single, aggregated master list and index, held by a private contractor at a single, central site, of every driver’s license or ID card issued by any state that chooses to issue any gold-starred licenses or cards compliant with the REAL-ID Act. The most significant of these fields is obviously the Social Security number, since that’s the single piece of data that makes it easiest to correlate or merge these records with the largest number of other government and commercial databases. 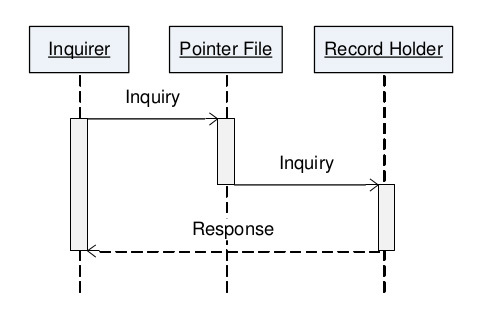 The Bulk Load process [is] necessary when a State of Record (SOR) is implementing SPEXS. It allows a participant to comply with SPEXS requirement that it must add pointers at the Central Site for all Real ID cards it has previously issued prior to SPEXS implementation. While all pointers for REAL ID credentials must be added as a part of Bulk Add, pointers for Non-Real ID cards may be added at a later date or may be added during initial Bulk Add. States aren’t (yet) required to upload pointers for noncompliant licenses or ID cards. There’s been no explicit announcement of the full live launch of S2S, but it appears that the first states are only beginning to use S2S (other than as a pilot project) this month. The DHS isn’t (yet) considering whether states have complied with the database access provisions of the REAL-ID Act when it makes its discretionary decisions whether to certify “material” compliance or “progress” toward compliance. 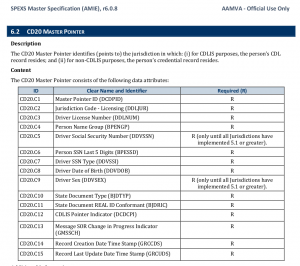 But AAMVA, which determines the SPEXS standards, could add a requirement for upload of pointers for all licenses and IDs, not just “compliant” ones, to its specifications for system participation at any time. And the DHS will eventually have to assess actual compliance with the REAL-ID Act, not mere progress toward it. At that point, any state that wants to use S2S and SPEXS as the basis for a compliance finding will have to upload pointer records for all licenses and ID cards it has issued — even noncompliant or “opt-out” licenses or IDs. Several things are wrong with this picture. 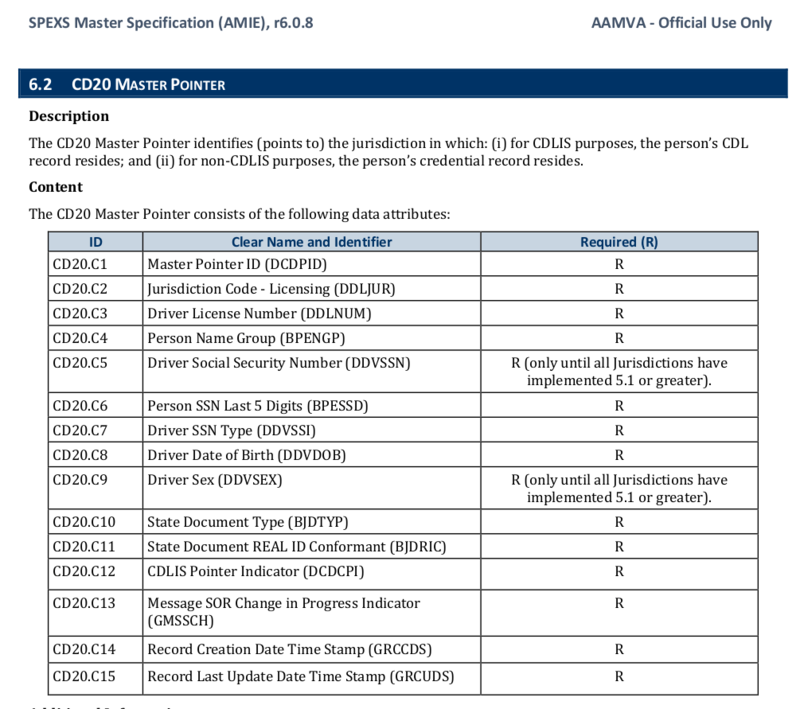 First, the amount of data about each driver or ID cardholder that a state has to include in the SPEXS pointer record it uploads is determined solely by AAMVA, a nominally “private” entity whose decision-making is completely opaque and which is not directly accountable to any single government agency, much less to due-process requirements such as those of the Federal Administrative Procedure Act. By requiring more and more of the information in state records to be included in the uploaded “pointers”, the index could be made to swallow as much of the state databases as its controllers desire, while still being represented as, “just an index” and not the actual database. As long as there is no affordable or available alternative to SPEXS to satisfy the data access requirements for compliance with the REAL-ID Act, any new or additional criteria established by AAMVA for participation in S2S and/or SPEXS will be de facto requirements for state compliance with the REAL-ID Act. A state that refuses to comply with AAMVA conditions for continued participation in SPEXS will cease to be compliant with the REAL-ID Act, and will have to revoke all compliant licenses or ID cards it has issued, or have Federal agencies cease to recognize them. There’s no procedure for a state, much less an individual, to obtain an “accounting of disclosures” to find out who has retrieved what information from their records in the “pointer” file at the SPEXS Central Site. It’s not clear whether any access logs for the files at the central site are created or retained. Third, once “pointer” data about state residents is uploaded to the “Central Site Data Stores,” it’s out of the state’s control. The state that uploaded the data has no way to know what information from the “pointer” database is being passed on to Federal agencies or other third parties, for what purposes, or even whether any data has been accessed by Federal or other non-state entities. AAMVA is a private entity, and a Federal agency could order AAMVA to hand over the entire contents of the “pointer” database while forbidding AAMVA from revealing the Federal data demand to participating states or members of the public. This may already have happened. There’s no way for us or any state to tell. States are right to resist playing this game, and to opt out completely from REAL-ID Act compliance or participation in the SPEXS national ID database. No to this…just no. along with all the government use…and including private businesses…I’m done. This is enough. No and I will continue to say no. As to knowing whether requests have been made, this has been an issue in libraries post-Patriot Act. Since a library can’t state that a request for patron data has been made, some libraries resorted to posting a statement saying “No federal information requests were received in month x,” or variations on that theme. One had only to look at the site to see if the statement was displayed to know if one or more requests had been received in a particular month. (Another, more subtle variation–send the library an email asking if they’ve received any data requests. If not, they’ll reply “no,” if they have, they’ll reply “we’re not allowed to share that information.”) I doubt that AAMVA as a private agency (technically a federal contractor in this context) could be convinced to provide such information. If they’re truly not logging requests in any way, they would of course be unable to do so. I would think that the DHS would want such a log, but not necessarily want to admit to having it. “In August 2015, Wisconsin was the first state to participate in S2S. North Dakota joined in November 2015. Maryland joined in early February 2016 and Indiana joined in February 2016. We have a total of 15 states that have signed Letters of Intent to participate in S2S. All 15 pilot states plan to implement the service by December of 2016…. Does the national database include vehicle registration data? I.E., if I register a vehicle in a REAL ID state but don’t have a driver’s license in that state, will I be in the database? Pingback: DHS postpones threats of REAL-ID Act enforcement | Papers, Please! Pingback: All the fake news that’s fit to print about REAL-ID and ID to fly | Papers, Please! Pingback: DHS threatens to harass American Samoan travelers | Papers, Please! Pingback: Is your drivers license or state ID in the national REAL-ID database? | Papers, Please! Pingback: Who’s in charge of the REAL-ID database? | Papers, Please! Pingback: “Governance” of the REAL-ID database | Papers, Please! Pingback: TSA announces “biometrics vision for all commercial aviation travelers” | Papers, Please! Pingback: REAL-ID database still lacks basic protections | Papers, Please! Pingback: Who’s paying for the national ID database? | Papers, Please! Pingback: How many times will the DHS cry wolf on REAL-ID? | Papers, Please!